"The greatest trick the Devil ever pulled was convincing the world he didn't exist. And like that... he's gone." There was a time in the mid-nineties when films weren’t films unless they contained a twist. At the forefront of this was M Night Shyamalan, whose magnificent Sixth Sense heralded a succession of movies in which the director eschewed basic storytelling and drama in favour of ‘the twist’. This law of diminishing returns has now led to Shyamalan directing garbage like The Last Airbender. Oh dear. 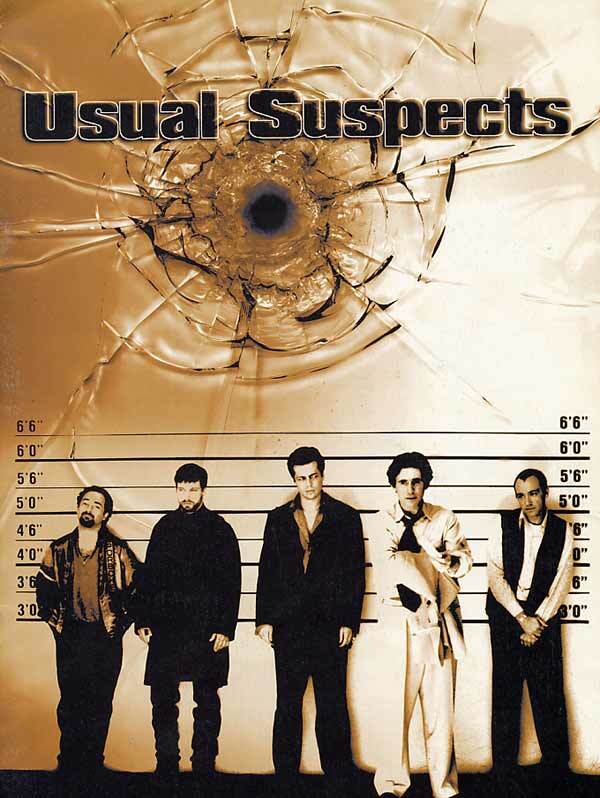 The film which started this trend remains the very best of the bunch: The Usual Suspects. Bryan Singer’s tightly plotted thriller features a wonderful ensemble cast clearly having the time of their lives, secure in the knowledge that the end product would be one of the greatest crime capers ever made. Beginning with a line-up which brings together a disparate group of crooks and low-lifes, with each of the characters forced to deliver the line, “hand me the keys, you cocksucker”. The scene was completely improvised and the cast are obviously having a blast as they interpret and reinterpret the line, corpsing and cussing their way through one of nineties cinema’s most memorable scenes. The line-up is, of course, a contrivance to get the characters together. Told in flashback, Verbal Kint (Kevin Spacey) is grilled by Chazz Palminteri’s police investigator Dave Kujan about an inferno which left a boat burned out with twenty seven charred bodies on board. Kujan is convinced that one of the bodies of that of his nemesis Keaton (Gabriel Byrne), a cop turned criminal who Kujan desperately wants to see dead. Kint relays the tale of their meeting (the line-up) and plot to rip off a fortune in gems from New York’s Finest Taxi Service – actually a cabal of crooked city cops. Those involved are the laconic Keaton, sociopathic McManus (Stephen Baldwin), incomprehensible Fenster (Benicio Del Toro) and sarcastic Hockney (Kevin Pollak). There is more to the heist than first appears, however, and soon the quintet are being pressured, bumped off and double crossed by the brains behind the operation – the shadowy Keyser Soze. 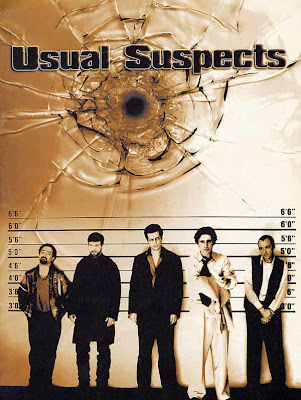 The Usual Suspects crams an incomprehensible amount into its compact running time. Every character is superbly drawn and acted (the memorable Fenster sticks in the mind vividly despite only being on screen for a few minutes) and credit must be given to the ensemble cast. But the real star here is Singer’s skill in telling Christopher McQuarrie’s deftly plotted script. To say too much is to nullify The Usual Suspect’s greatest strengths – not a mistake I’ll make here. Suffice to say that the film is one of cinema’s greatest ever puzzles and ends with a moment that will genuinely cause you to catch your breath, blink and then re-evaluate everything you’ve just seen. Alfred Hitchcock couldn’t have done a better job of filming this masterful masterpiece of a movie: praise indeed.